Platinumloops now offers all of our loops in the popular Apple Loops formats known as ‘AIFF’. When you purchase any of our Loop packs you get to download a ZIP file which contains your loops in these formats. ‘AIFF’ – Apple Loops are an audio file format for Garageband and Logic on Mac OS. 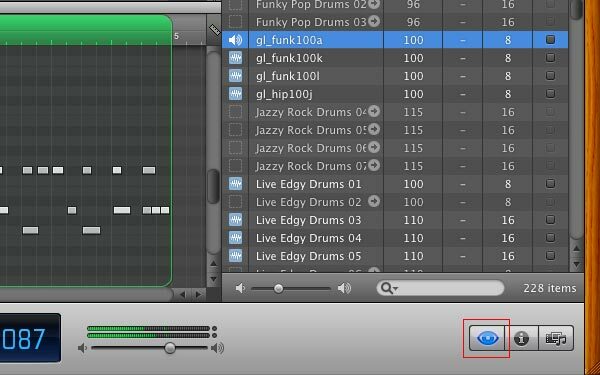 Apple Loops typically contain meta data within the file which helps when indexing the files into the Garageband loop browser. Typical data would include tempo, instrument, genre, key reference. Apple Loops have become a popular file format for Mac users who favor Garageband and Logic. Mac users will pay no extra charge for Apple Loops, everybody pays one price and gets all three formats that include WAV files and Rex2 files for users of Reason. Within our product pages you will find hundreds of free demo loops. These can be easily located by using the Genre, Instrument and MegaPack links to the right of every page. Simply click on the Loop Genre that you are interested in and you will be presented with a list of loop download packs for that genre. By clicking on the “Free Demo Loops” share button for each pack you will be able to download a free ZIP file which contains free demo loops from that loop pack. If you’ve ever wondered how to go about importing your Apple Loops into Garageband or Logic you’ll be glad to learn that we’ve created a tutorial showing you how it’s done. Read the tutorial here. Windows users can still open and work with .AIFF files but won’t get any benefit from the metadata which is exclusive to Mac OS. In that respect any AIFF files you use on a Windows PC will just behave like a standard WAV files.